David Byrne has continuously expanded his creative horizons. He has taken turns as film director, author, visual artist, record label head, and even urban cycling advocate since first being introduced to the world as the “Bowery Bowie” front man of the punk-ish boho band Talking Heads. This Blu-Ray DVD finds him back in the musical mix. “Ride, Rise, Roar” is a documentary of the 2008/2009 tour which supported the Byrne and Eno album “Everything That Happens Will Happen Today” and was captured at several shows over its course. 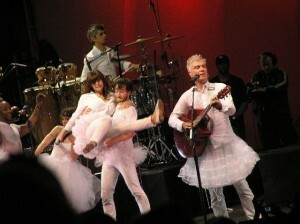 For this outing Byrne chose to augment his stage band with a dance troupe. So, while a rock concert on the surface; the show also plays out as a modern dance theater experience. Hiring several choreographers whose work he was familiar with Byrne had them organically build movement into the experience. This film encompasses a broad look at the show from inception to stage. Fans of Byrne will enjoy a look at the process as tour numbers come together in rehearsal and I’m happy to see the behind-the-scenes work integrated into the film rather than banished to DVD extra features. After-all you can’t work with Brian Eno unless the journey is as important as the destination. Practice segments and interviews with collaborators are presented in black and white to juxtapose them with polished performances and footage is often intercut into a single song piece. It’s fun to see rehearsal room shots of a T-shirted Byrne, the cast and choreographer in montage with the finished number on stage. Byrne is not shy to perform material going all the way back to his earliest days, including Talking Heads milestones “Life During Wartime” “I Zimbra”, and “Once in a Lifetime”. I think many would agree that the definitive live performances of these songs were captured in Jonathan Demme’s “Stop Making Sense”, but that was a long time ago and the material has evolved enough to make “Ride, Rise and Roar” a worthwhile experience. Byrne and company are the essence of cool in white head to toe, including a white Fender Stratocaster guitar. The “big suit” may be in storage but you haven’t lived until you see David and the band perform “Burning Down the House” in white tutu’s. If some of this sounds like loopy pretense it is saved from art school overload by Byrne’s delivery which lets honesty and good humor triumph over artifice. He’s having a great time, you want to indulge him. Having seen one of the show’s on this tour I can say that the dance movements were designed to make a statement based on the audience’s view of one edge of the proscenium arch to the other. Unfortunately cinematic deconstruction of the set into one, two and three shots, and particularly side shots, often blunts the show’s kinetic power and circumvents the choreographer’s original intent. Though it is the antithesis of modern quick cut film-making more static shots of the entire stage tableau would have better represented the performances. “The hits” will please the general audience but it’s the newer material comes off really special on stage. Being reintroduced to tunes that got by me when the Byrne/Eno album was released (“Life Is Long” and “One Fine Day”), with live interpretations which I prefer, makes the DVD well worth owning. My personal reservations about how theater is interpreted by film aside I found “Ride, Rise, Roar” to be a very enjoyable and interesting look into David Byrne’s brain and the methodology of his collaborators. It’s hard to believe it’s been two years since David Bryne’s performance at Brooklyn’s Prospect Park Bandshell on opening night of that year’s Celebrate Brooklyn concert series. It was a great night with a really nice crowd of friendly folks who shared a chat, a love of music, and even some wine (in a box!) Kenny Pierce was there too and his selection of photos from our vantage point is on view at his blog. Wow, I had to chime in and agree that I could not believe two years had passed since that show was attended. I concur to the quality of time that was spent and I really enjoyed the presentation from beginning to end. This DVD film is a must have in my book and fans and the curious alike should investigate purchasing a copy.